The Greater Round Lake Fire Protection District is asking voters to give them permission to borrow $4.5 million on Nov. 6. Fire Station 1 is outdated which makes getting from the second-floor living space to the apparatus floor an unnecessarily long and potentially dangerous journey, according to Fire Chief Greg Formica. Station 1 was constructed in 1946 to be used by a small volunteer crew. In the 72 years since, the population of the 15-square-mile district has jumped to about 53,000 people. Now a crew of 7 to 8 firefighters stay in the building 24 hours a day. Firefighters stays in a converted space on the second floor far from the trucks. While there is a fire pole, it isn’t in a good location so the firefighters use the stairs. They would solve the issue by building a new living area on the first floor next to the apparatus bay. Other building issues that the borrowed money would address include leaky roofs and patchy parking lots at several district stations. The district doesn’t have detailed plans drawn up yet, but they paid an architect to help estimate the cost of the Station 1 plan and other projects they hope to fund. They haven’t gone to voters for a referendum since 1979, and that was to provide ambulance service. The Greater Round Lake Fire Protection District includes most or all of Round Lake, Round Lake Beach, Round Lake Heights, and Hainesville. Barrington firefighters responded to a fire Tuesday morning at a three-unit apartment building in the 300 block of East Russell Street. One person was treated and released at the scene. A resident called the fire department at 7:49 a.m. after seeing smoke coming from the first floor where a sauna was located. When firefighters arrived, they found heavy smoke and fire and did not immediately know whether other residents were home. They brought the fire under control within 27 minutes. One unit sustained heavy fire damage while the other two units had smoke damage. The entire building was declared uninhabitable and residents are being assisted by the Red Cross with relocation and other immediate needs. The cause of the fire remains under investigation but is not being considered suspicious. Assisting Barrington were firefighters from the Barrington Countryside FPD, Lake Zurich, Fox River Grove, Long Grove, Buffalo Grove, and Wauconda. 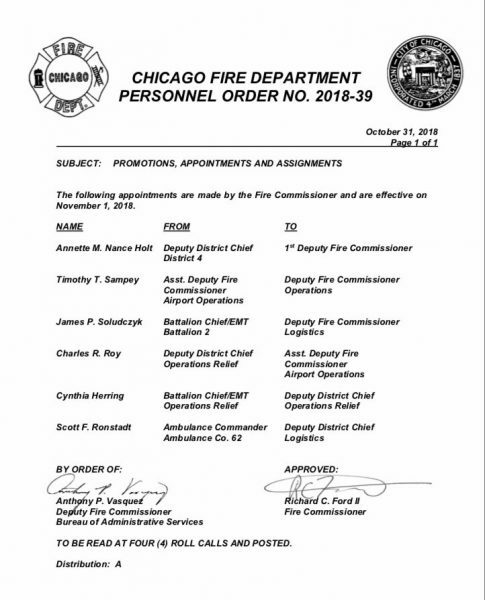 Take home a piece of Chicago Fire Department history! 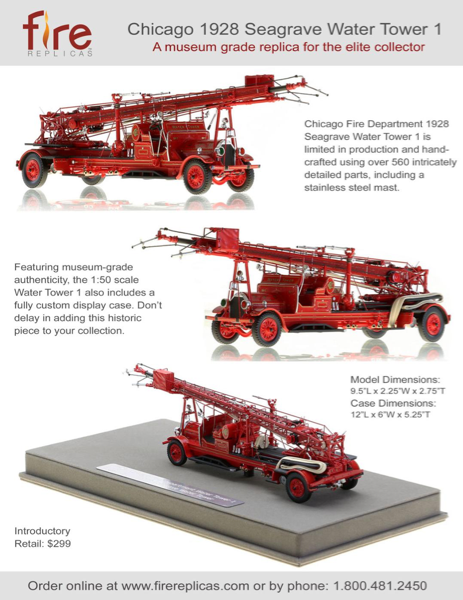 This 1:50 scale museum grade replica of Chicago’s 1925 Seagrave Water Tower 2 is hand-crafted using over 560 intricately detailed parts and includes a display-ready, custom case. Production is limited, so don’t delay.